Software-defined networking (SDN) has been touted as the answer to all of the challenges of managing your network infrastructure. However, SDN is an architectural model for networking, not a reference design based on a well-defined set of protocols or standards. Gartner has developed a set of recommendations designed to help infrastructure and operations (I&O) leaders deliver on the promise of SDN. Read this Gartner report to gain their valuable insights. 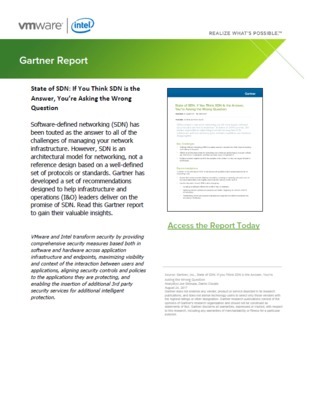 Source: Gartner, Inc., State of SDN: If you Think SDN is the Answer, You’re Asking the Wrong Question Analyst(s):Joe Skorupa, Danilo Ciscato August 24, 2017 Gartner does not endorse any vendor, product or service depicted in its research publications, and does not advise technology users to select only those vendors with the highest ratings or other designation. Gartner research publications consist of the opinions of Gartner’s research organization and should not be construed as statements of fact. Gartner disclaims all warranties, expressed or implied, with respect to this research, including any warranties of merchantability or fitness for a particular purpose.